It's a little easier than I'd like to admit to forget how magical Los Angeles can be. But sometimes magic has some history to it. About a year back, Diego was on a trip to Los Angeles and began experiencing headaches serious enough to take him to the hospital. Imagine this: one minute you're on a trip across the country from your home, the next, by way of a few doctors, you're in front of a neurologist who is telling you that you need to get into surgery immediately. And no, you can't get the surgery back home in Georgia. It's that serious. Diego had a cyst in his brain which was causing a build up of fluid that was life-threatening. Without the surgery right then, he would die. It's just about one of the scariest scenarios I can come up with. Of course, all you want is to be home with your loved ones. The neurologist took the first part off the table, but that doesn't mean a loved one can't come to you. I can't guarantee this part of the story, but I'd bet there wasn't a red light bright enough to stop Diego's girlfriend Kristina on the way to the airport to be with him. The basic story is this: Diego's last trip to Los Angeles with his girlfriend had been a bit of a nightmare. This trip is going to be memorable for an entirely different reason. You see, Diego's girlfriend is an amazing woman who has been with him through a lot (understatement). Diego has no intention of going home with a girlfriend; he's going home with a fiancé. And, being the smart man that he is, Diego wants to have this trip remembered for every right reason there is. That's where I come in. I was lucky enough to show up when the magic did. Diego proposed at sunset, at the Griffith Park Observatory. Traffic was fighting him, but when you've given death the finger, traffic parts when you need it to. And, of course, she said yes. They get engaged while in Los Angeles and suddenly they're the coolest people you've ever seen, right? But that's their secret: nothing sudden about it, they're just that cool. Diego's story of his surgery and recovery is amazing. But what's even better, is that Kristina was right there with him, every step of the way. Diego and Kristina ended up back where our story began. But now, they're healthy, happy, and engaged. I was so happy when Shannon called me and told me her wedding was going to be in Los Angeles. She had hired me to shoot their engagement photos, but the wedding was all set for Georgia at the time. Shannon and Devin are a super sweet couple. She was very pleased with their engagement shots and hired me to shoot their wedding. I met with the bride and groom several times to discuss their photos, the wedding layout and to get a feel for their wedding. Shannon started a Pinterest board, which always makes me happy because it adds an extra level of creativity to the looks of a shoot. On the day of the wedding, I arrived to photograph the bride getting ready. I was happily met by a fun three-year-old and the women of Shannon's family. There were so many moments between the bride, her sisters, and best friend. I shot as her mom zipped up her dress and the final touches were completed. I next met up with the bride and her family at the church where I spotted the bride behind the curtain, she was a cute ball of excitement. The groom was laughing with his mom when I walked in to see how he was doing. His father and best man were also there, just enjoying themselves. Shannon was getting married into a great family. The ceremony started with the groom and his mother walking down the aisle, followed by the wedding party (and that same fun three-year-old flower girl). 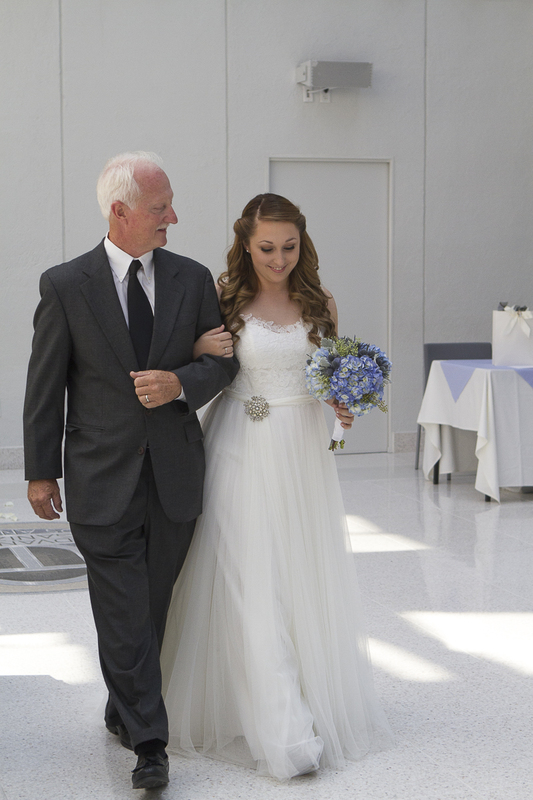 Then, Shannon's father walked her down the aisle. I always love and admire this moment. And soon after, Devin and Shannon were married! Next came the family photos, we had the perfect spot nearby, which was all green and blue and totally matched the colors of the bridesmaids' bouquets. During one of the bride's family photos the sister tells her daughter, if you smile, you get more cake… and more cake she got! We went back to a good meal, lots of clinking glasses, and a very happy daughter drinking apple cider and eating cake. The cake was made by the bakery at Alcove and after the groom placed it in the bride's mouth she said, "That’s delicious!" Followed by, "Get your own piece" to her husband. The couple had their first dance, and then the floor opened up and everyone joined in. The clients wanted to go to Griffith Park. After the festivities ended, we went there, pulled out the Pinterest board Shannon and I had worked in the previous weeks and had even more fun! Thank you for taking the time to look over these shots. I love that I got to be a part of Shannon's wedding and am very happy for this couple. They love each with all their hearts, and it shows. Kristin's friends and family surrounded her with love, celebrating her upcoming wedding day. This was a lot of happy ladies in one room! Erin and I prepared for this shoot by planning it out with a Pinterest board. I'm so glad we did! The results were exactly what she wanted!